“Holy War, Inc.,” Sunday’s installment of “National Geographic Explorer,” complements “Unholy War” in more than its title: it begins in Pakistan with a classroom of little boys being trained for a jihad. Based on Peter L. Bergen’s new book, “Holy War, Inc.: Inside the Secret World of Osama bin Laden,” it relies more heavily than Ms. Shah’s films on Western experts and reporting. And although it is disappointing and perfunctory next to Mr. Bergen’s slim yet thorough book, it has a thoughtful, opinionated quality rare among current documentaries. As the forces of the Northern Alliance roll through town after town in Afghanistan, including now the capital of Kabul, a question presents itself: Where’s Osama bin Laden? Finding someone who lives in a cave and communicates via satellite television is no walk in the park. British journalist Peter Bergen cautions that “When you go looking for Osama bin Laden, you don’t find him: he finds you.” Well, he certainly found us on September 11. It would be much to our advantage were we to find him before he finds us again. In 1997, CNN correspondent Peter Bergen interviewed an obscure terrorist in Afghanistan. Of course, that was back when the Western world knew little about Osama bin Laden. And cared less. In “Holy War, Inc.,” Bergen compares Bin Laden’s Al Qaeda network to a multinational holding company, with similar global reach. It has a truly international roster of “employees,” drawn from at least 24 countries, including America. 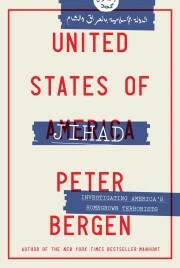 El libro de Peter Bergen, analista en temas de terrorismo de la CNN, fue una de las grandes estrellas de la feria de Francfort, y hay que decir que si solo se tiene tiempo para una biografia del hombre mas odiado de Occidente, lease Bin Laden, esta debe ser la eleccion. Cuatro anos tardo Bergen en recopilar la informacion y otros dos en redactar esta biografia, que finalmente tuvo que ser revisada a toda velocidad para ponerla al dia tras el 11-S. Professor Sir Michael Howard MC knows a great deal more about warfare than I do, or ever shall. His elegant analysis of the current crisis, first delivered as a lecture to the Royal United Services Institute last week, has been hailed as “brilliant”, has been widely reported, reprinted in full, and is fast becoming the locus classicus of those opposed to military intervention in Afghanistan. Who am I to criticise a former Regius professor? I feel, metaphorically, like a Taliban fighter loosing off a couple of rifle rounds at a passing B52. Thursday, Nov 01, 2001 Atlantic Monthly Review of Holy War Inc.
few hours after the first American air strikes against Afghanistan, on October 7, a pre-recorded videotape was broadcast around the world. A tall, skinny man with a scraggly beard, wearing a camouflage fatigue jacket and the headdress of a desert tribesman, an AK-47 assault rifle at his side, stood placidly before a rocky backdrop. In measured language Osama bin Laden again declared war on the United States.